Women workers on the staff of the Empire Cinema, Loughborough, travelled by a shuttle service of taxis to Quorn Parish Church on Wednesday for the wedding of Mr. Edward K. Deeming, general manager of the cinema. Most of them could be spared from duty for only a few minutes so some saw the bride as she entered the church and some as she left. 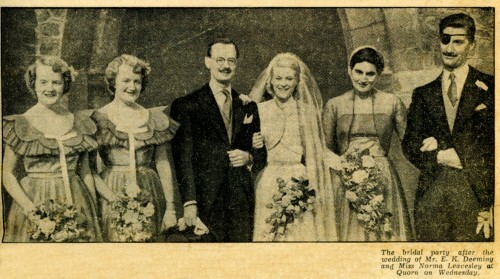 Mr. Deeming, son of Mr. C. K. Deeming, owner of the Empire and Victory cinemas, and Mrs. Deeming, of One Ash, Quorn, was married to Miss Norma Leavesley, daughter of Mr. and Mrs. James Howard Leavesley. of Rawdon. Leicester Road, Loughborough. The reception at the King’s Head Hotel, Loughborough, which followed the wedding was a double celebration, for the day was also the bride’s 21st birthday. Over 100 guests attended the reception after which the couple left for their honeymoon in the Mediterranean Balearic Islands. Given away by her father, the bride wore a gown of peach bloom broche damask satin with a trim-fitting short bolero and full skirt. and a headdress and veil in silk net to tone, She carried a bouquet of pink rose-buds. Her attendants were Miss Eliane Tedd and her twin sisters, the Misses Pamela arid Monica Leavesley, all of whom wore dresses of peach pink poult with a pewter grey net overlay. The best man was Mr. Kenneth Reader, and the ceremony was conducted by the Vicar of Quorn (the Rev. W.' E. Pilling).